Pune- Targeting Prime Minister Narendra Modi led BJP government for failure at various levels especially demand of youths and students from all over the country, ‘ Young India Adhikar March’ is organised at New Delhi on 7th February to protest against the government for not fulfilling the demand especially in education and employment sector. Expenditure on education must be atleast 10% of budget, complete the backlog in all government department, formation of anti- sexual harassment cell at university and college campus, entrance and competitive exam should be conduct free and fair manner to avoid the bribery and corruption, to stop the pattern of paper leak, implementation of the reservation policy are the main demands, N. Sai Balaji, president of Jawaharlal Nehru Student’s Union , Kalyani Durga Ravindra of Lokayat, Aadith V Sathvin of FTII student and alumni union, Alok Kamble, Yuvraj T S Gatkal have given information in press conference. 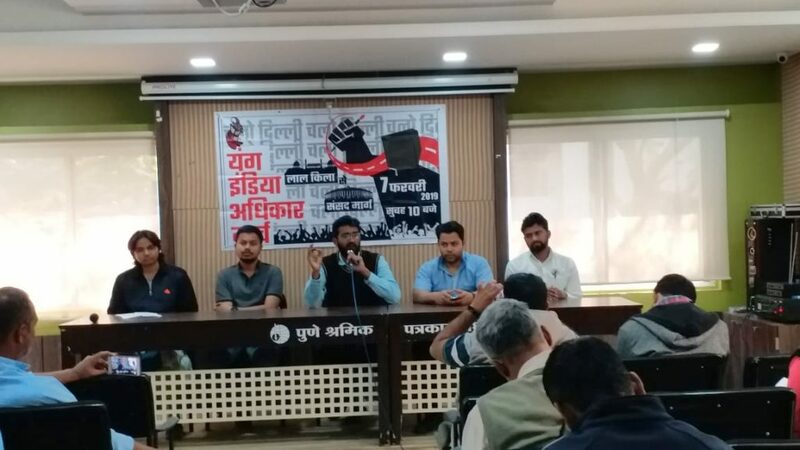 Most of the students union have come under the banner of ‘Young India Adhikari March’ and formed the ‘India National coordination committee’ concern with the demand of youth and student,comprises many student organizations. Young India Adhikar March has demanded the stipend ₹18000 for unemployed, monitoring the entrance and competitive exam in free and fair manner to stop the bribery and corruption, end the contractualisation of jobs, implementation of constitutional reservation, control of High Fee structure in education, fellowship for all student in research, waiving off the student loan unconditionally, withdrawal of police charges against students and India National Coordination Committee has also appealed to youth and student to join them for their bright future.